Republican candidate Mitt Romney has hit back on attacks about his record as CEO of Bain Capital in interviews with US broadcasters. “I had no role whatsoever in the management of Bain Capital after 1999,” Mitt Romney. Mitt Romney was responding to reports suggesting he was still listed on Bain’s regulatory filings several years after he said he left the company. He called on Barack Obama to apologize, after the president said Mitt Romney’s time at Bain should be scrutinized. The timing is key because between 1999 – when Mitt Romney said he left the company he founded – and 2001, Bain was responsible for closing down American firms and shipping jobs overseas. Speaking to WJLA-TV a few hours before Mitt Romney’s own media appearances, President Barack Obama said the Republican candidate would have to answer questions about when he stepped down from Bain Capital. “Ultimately, I think Mr. Romney is going to have to answer those questions because if he aspires to being president, one of the things you learn is you’re ultimately responsible for the conduct of your operations,” Barack Obama said. But Mitt Romney said attacks on his record at Bain, an investment company he co-founded in 1984, were “simply beneath the dignity of the presidency of the United States”. “He [Obama] sure as heck ought to say that he’s sorry for the kinds of attacks that are coming from his team,” he told ABC News on Friday night. With November’s election now less than four months away, the Obama and Romney campaigns have spent much of the week trading accusations of dishonesty over Mitt Romney’s time at Bain. 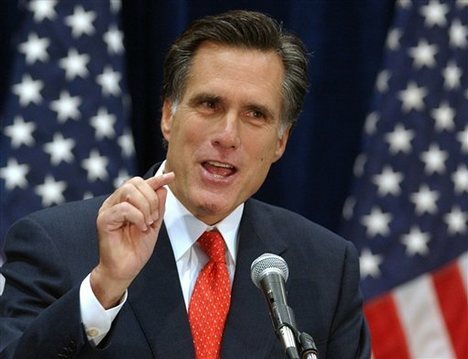 In a series of television and web advertisements, the Obama campaign argued that Mitt Romney had “pioneered” outsourcing US jobs during his time at Bain. The Romney campaign responded with their own ad, calling Barack Obama the “outsourcer-in-chief”. The Boston Globe reported on Thursday that documents filed with the Securities and Exchange Commission conflicted with Mitt Romney’s statements that he gave up control of the firm in 1999. The filings list him as “sole stockholder, chairman of the board, chief executive officer and president” from 1999 to 2001. That period covers a time when Bain ran companies that fell into bankruptcy, as well as moved jobs abroad – issues highlighted by Obama campaign advertisements. The Obama campaign has accused Mitt Romney of lying in his official campaign disclosure forms. Barack Obama spokeswoman Stephanie Cutter suggested that Mitt Romney had broken federal law by doing so – an accusation the Romney camp firmly denied. Mitt Romney and his aides say he left Bain in 1999 to run the 2002 Salt Lake City Olympics. In a statement, the company said Mitt Romney “remained the sole stockholder for a time while formal ownership was being documented and transferred to the group of partners who took over management of the firm in 1999”. Independent website FactCheck.org said on Thursday it had found no evidence that Mitt Romney actively managed Bain after leaving in February 1999, describing him as “a passive, absentee owner”. The site had previously said that Mitt Romney would open himself up to felony charges if he had actively managed Bain after 1999 but said otherwise on his disclosure form.